I remember this day clearly. Was it really over 25 years ago? That’s my dad in his younger years… he ran a gas station, and my mom would take me out for quick drives after lunchtime to visit him at the store. He always greeted me with a cherry red Ring Pop. I eventually grew to love Fruit Roll-Ups over these incredibly delectable and sweet balls of sugar, but for the first 5 years of my life it was all about the Ring Pop. You know, life has a funny way of casting out a hook of hope when you’re feeling like you’ve finally hit that dead end. I met up with a friend about a week ago, and she asked about my dad and how he was doing. She had apparently seen him on multiple occasions, and noticed that his physical condition was worsening. My friend had also mentioned how she felt like she had hit a dead end with her sibling and his substance issues. Eventually she realized that her attitude was contributing to the barrier between her and her brother, and decided that what she really needed to do was just love him, and show him that she loved him. 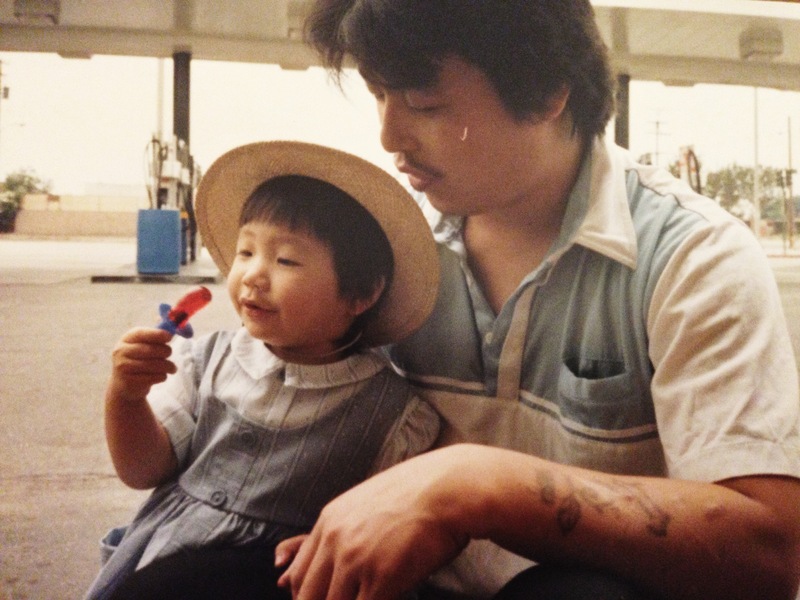 I realized that I had been very closed off in my encounters with my dad. I was protecting myself, and in the process, I presented a tough exterior that wasn’t always loving. As she began to tell me about her experiences, my mind started to go back to the days of my childhood and the experiences we shared where I felt loved and special. I felt special when he presented the crinkly wrapping of a Ring Pop, carefully opening it for me while sliding the plastic ring around my finger with a big grin. His eyes would sparkle, and his voice rolled into a low laughter. I was his special little girl! This memory sparked an idea. What if I visited him with a Ring Pop? The last time we had shared Ring Pops together was probably over 20 years ago. I figured this would be a great way to penetrate through the barriers, and communicate with a symbol of my childhood and his fatherhood — a simple cherry flavored Ring Pop. I bounced the idea off of my friend, and she agreed that it was worth a try. We finished our lunch at Da Spot, and made a run to Longs Drugs scanning for Ring Pops. There was one cherry flavored Ring Pop left in a half empty box stuffed at the bottom of the rack. I grabbed the cherry flavored one for him, and a watermelon for me. As we drove around towards his usual area, nearly 15 minutes had passed by and we were starting to feel like maybe it wasn’t the right time. Another 5 minutes went by and still nothing. Then my friend spotted him on the corner of a street, and we pulled a quick u-turn and I parked into a stall in front of a mini mart. As I grabbed my pair of Ring Pops, I noticed that my dad was looking up eye-level towards the cars and pedestrians. Usually his head is bowed down, and he won’t make eye-contact with anyone. This time was different. I approached his direction from behind, and just as I started to get closer he began to cross the crosswalk. A group of teenage boys had been walking alongside him, and I missed a couple of steps while trying to speed up behind him. When I finally caught up with him, I said “Hey Dad, how are you doing?” He turned his head towards my direction and asked what I was doing here. I said I happened to be in the neighborhood, and slowly opened up my palm to show him the Ring Pop. He asked what it was, and I opened up the wrapping and held out the Ring Pop around my finger. As I reached towards his hand to place it around his finger, he pulled away and shook his head. He didn’t want it. Dad finally said he wanted to eat it later, and asked that I place it by the storefront wall behind us. Sure, I could do that. I turned around and placed the Ring Pop in a small crevice against the wall, and came back to stand next to him as he gazed out towards the passing traffic. Time seemed to slow down for the few minutes we shared standing there together. The cars moved slower, the noises sounded as if I were underwater, the wind felt dry and dusty, and the world around us seemed to lose inertia. The gravity of our society, and all the busy movement that comes with it seemed to lose importance. For those few minutes we existed as equals because we are simply alive together. It didn’t matter that he had only the clothes on his back, and that I had a job… it didn’t matter that later that day I would have to go back to work and he would stay on the streets. All that mattered was that we were alive and together, and in whatever brief moments we share, we are father and daughter. And nothing will change that. This was a breakthrough. That’s the man I remember. A grain of witty, and as direct as a knife pointed straight at your face. You knew when he meant business. I felt my heart skip another beat of hope with this shared moment of laughter. We were connecting. I don’t have very many memories of this man, but it warmed my heart to know that despite his circumstances we were still able to make new memories. Despite his incredibly stubborn nature, he was willing to share a laugh with me that day. I knew I didn’t have much time before I had to go back to work, so I gulped a big breath of air and told him that I loved him. I told him I loved him again and once more just so it would sink in. Although he didn’t respond, I know he heard my words. I smiled back at him and said, “You too, everyone deserves another chance.” He nodded and I ran across the crosswalk back into my car where my friend was waiting with arms ready for a hug. Life is not easy, life was not meant to be easy. We all have something to carry, but we learn from the weight of our experiences and grow stronger because of them. I have a lot of hope tonight, and I wanted to share it while it was fresh in my mind and heart. Smile everyday, see the good, and share the positivity while you can. Goodnight. What a very powerful ending. Can imagine how it feels to have the effort you put into connecting with your father acknowledged by another homeless person. Keep trying, I know it takes a lot out of you and sometimes you feel like you just want to give up, but keep trying. I believe its the best thing you can do for yourself and your dad.